Experimenting with food combos to create an ultimate protein-packed smoothie is challenging when you are not a nutritionist, which is why I am here to help you stop spending money on all those seemingly helpful and healthy protein powders and opt for all-natural food combos to make a protein-rich smoothie. Besides protein, the following smoothies are fortified with many other vitamins and minerals. When I first read about adding quinoa to green smoothies, I though that author was crazy. However, as soon as I tried this idea, I loved it. I also figured out that spinach and quinoa are two powerful protein-rich smoothie ingredients that create a nutrient-dense morning drink that will keep you full until lunchtime. Add some berries to your smoothie for a quick antioxidant boost. This food combo is for green smoothie junkies like me. Why? Because its taste may be a bit plain (even if you add one banana, which I don’t recommend doing). Anyway, a cup of uncooked whole quinoa provides 24 grams of protein and a cup of kale contains almost 5 grams of protein. This means you will get almost 30 grams of protein from this awesome healthy food combo. I know many of you dislike quinoa, so I found a perfect alternative for you – oats. Even though they are not the best source of protein, you can get almost 20 grams of protein by adding oats and spinach to your morning smoothie. The smoothie helps reduce and prevent inflammation, speed up your metabolism, improve your bone health, boost your energy levels and strengthen your immune system. Depending on what you are going to put in your green drink, kale and chia seeds can add around 15 grams of protein to it. Apart from protein, kale and chia seeds are rich in fiber, magnesium, and iron, which are all good for those trying to drop pounds. Chia seeds are considered as a superfood, so don’t pass by the next time you go grocery shopping. If you crave something sweet, a protein-rich fruit smoothie is your best bet. 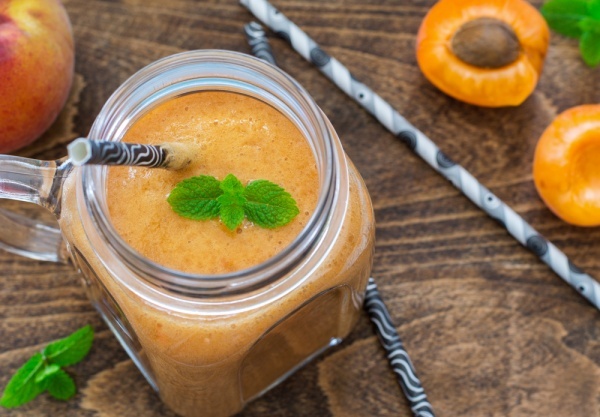 Apricot smoothie with chia seeds will provide your body with protein, fiber, potassium, magnesium, along with vitamins A and C. No need to add a protein powder. A half cup of pumpkin seeds provide your body with 6 grams of protein and a half cup of oats provide 7 grams. Add a cup of banana and kiwifruit and you will get another 2 grams of protein. Pumpkin seeds are a great source of potassium, magnesium, iron and zinc, making it an ideal ingredient for your nutrient-packed smoothie. We know avocado is a wonderful source of healthy fats, but it contains protein as well. Avocado provides 3 grams of protein per cup – it does not seem that big, right? However, when you combine it with other protein-rich foods, you can end up making a powerful protein-packed smoothie without any powder at all.